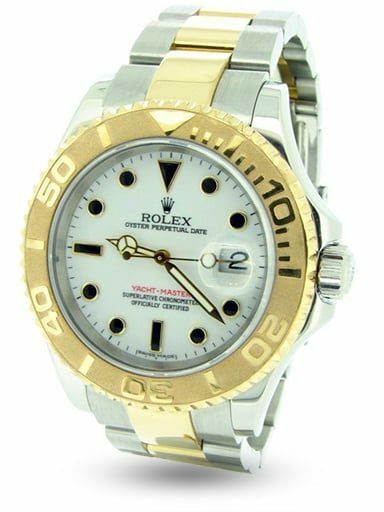 Rolex Yacht-Master mens 40mm pre owned watches look great on land, as well as the open seas. Our selection offers a variety of dials, bezels and bands. 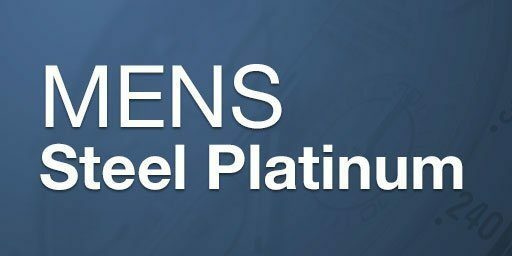 Choose from stainless steel and platinum, and two tone. Either way, we are confident that you will find a Rolex watch for any occasion. Keep in mind, Beckertime offers a 30-day money-back guarantee and Lifetime TradeUp Guarantee on qualified items. Also, we strive for your 100% satisfaction. So, don’t hesitate to contact us. While Rolex built the Submariner to dive deep underwater, the Yacht-Master is more at home navigating the waves aboard a luxurious boat. More cruise wear than dive suit, the men’s Yacht-Master is casual chic at its best. 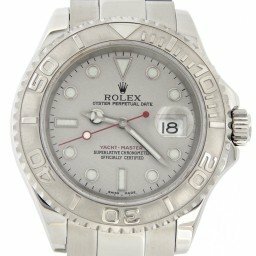 In the past 25 years since the men’s Yacht-Master made its debut, Rolex has consistently changed up the assortment by discontinuing some models while adding other ones. Despite the variety, all mens Yacht-Master watches have design elements in common of course. These include a 40mm Oyster case and a bidirectional rotating 60-minute graduated bezel. Furthermore, the dials include a date window, and luminescent indexes and Mercedes-style center hands. Also, since the Yacht-Master was created for nautical adventures, it boasts the Triplock screw-down winding crown to keep the water out. 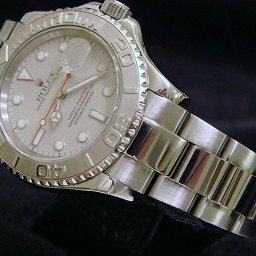 Should the Yacht-Master find itself overboard, it does have water resistance to 100 meters (330 feet). Now that we’ve established the similarities among all men’s Yacht-Master models, let’s have a look at the differences across five models. The yellow gold Yacht-Master ref. 16628 was, in fact, the first of the collection. Along with its solid gold Oyster case, the men’s Yacht-Master ref. 16628 also includes a solid gold Oyster bracelet completing the look of the ultra-luxurious sports watch. 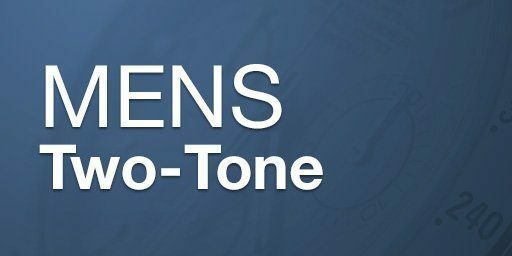 Although there are other dial colors such as navy, slate, champagne, and mother-of-pearl, the most common dial color is white studded with black indexes. Interestingly, the black hour markers don’t actually glow in the dark but rather, there are small luminescent triangles next to them that do. 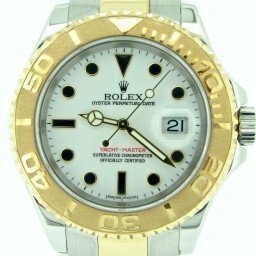 Rolex no longer produces a yellow gold men’s Yacht-Master so the secondary market is now the place to source them. For a men’s Yacht-Master that balances ruggedness and luxury, there’s the yellow gold and stainless steel two-tone version. The Yacht-Master ref. 16623 is the men’s version of the Rolesor Yacht-Master. Interestingly, the first two-tone Yacht-Master models were only available in the ladies 29mm size and the midsized 35mm editions. The 40mm men’s Yacht-Master ref. 16623 only joined the lineup ten years later in 2005. Just like the full yellow gold version, the two-tone yellow gold and steel men’s Yacht-Master is also no longer in production. Hands down the most popular mens Yacht-Master model is the stainless steel and platinum version. The combination of steel and platinum, dubbed as Rolesium by Rolex, is exclusive to the Yacht-Master collection. The platinum bezel combines a sandblasted background with highly polished raised numerals. Some versions also include a platinum dial, which makes the watch glisten beautifully in the sunlight. 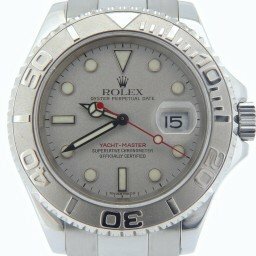 There are two references of the mens Rolesium Yacht-Master. Rolex introduced the first model, the Yacht-Master ref. 11622, in 1999 and followed it up with the updated ref. 116622 in 2012. The current men’s Yacht-Master in stainless steel and platinum includes an improved clasp, in addition to the bezel with 120 clicks. At Baselworld 2015, Rolex unveiled a brand new men’s Yacht-Master in Everose rose gold along with the novel Oysterflex bracelet. Everose is Rolex’s patented rose gold alloy that will never fade, while the Oysterflex bracelet is the brand’s version of a rubber strap that is actually composed of a metal blade coated in black elastomer. Moreover, the Yacht-Master 40 ref. 116655 also includes the black Cerachrom ceramic bezel. 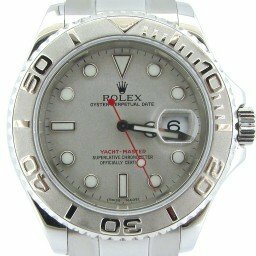 This is by far the most unique looking men’s Yacht-Master within the catalog, replete with Rolex innovations and inventions. Finally, the newest men’s Yacht-Master that sailed onto the scene is the two-tone Everose gold and stainless steel Yacht-Master ref. 116621. Introduced just last year at Baselworld 2016, this is the current version of a two-tone Yacht-Master for men. The chocolate brown dial is especially attractive paired with the warm tones of the rose gold details. With the fleet of available options, it can be challenging to pick out just one men’s Yacht-Master among the lineup. However, no matter which one you settle on, the Yacht-Master is one of Rolex’s most elegant sports watches out there.